Spray 12-inch nonstick skillet with cooking spray. Add stir-fry vegetables to skillet; cook 2 to 3 minutes, stirring frequently, until crisp-tender. Stir in corn, salsa, beans and frozen chicken. Heat to boiling. Reduce heat to low; cover and simmer about 5 minutes, stirring occasionally, until chicken is thoroughly heated (break up large pieces of chicken with spoon as mixture cooks). Meanwhile, heat water to boiling. Stir in couscous. Remove from heat; cover and let stand 5 minutes. Fluff couscous with fork; spoon onto serving plates. Top with chicken mixture. Sprinkle with cilantro. If you don't have the stir-fry vegetables, use a combination of one or more colors of chopped bell peppers and onion to equal 1 cup. For delicious handheld sandwiches, omit the couscous, spoon the chicken mixture onto flour tortillas and roll up. 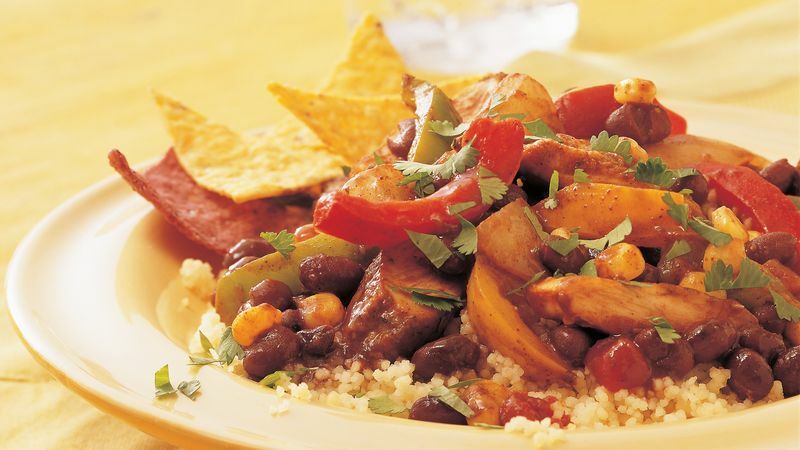 Use your choice of mild, medium or hot salsa to make this dish as mild or spicy as you like.